Carrots and Nutrition Fruits Vegetables Antioxidants Beta Carotene Vitamin C and More. All You Ever Wanted to Know About Carrots and Nutrition. 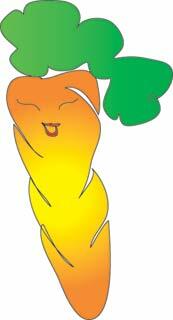 Carrots are nutritional heroes, they store a gold mine of nutrients. No other vegetable or fruit contains as much carotene as carrots, which the body converts to vitamin A. The carrot is an herbaceous plant containing about 87% water, rich in mineral salts and vitamins (B,C,D,E). Raw carrots are an excellent source of vitamin A and potassium; they contain vitamin C, vitamin B6, thiamine, folic acid, and magnesium. In order to assimilate the greatest quantity of the nutrients present in carrots, it is important to chew them well - they are the exception to the rule - they are more nutritious cooked than raw. So in reality, unlike most other vegetables (though not all), carrots are more nutritious when eaten cooked than eaten raw (except when juiced). Because raw carrots have tough cellular walls, the body is able to convert less than 25 per cent of their beta carotene into vitamin A. Cooking, however, partially dissolves cellulose-thickened cell walls, freeing up nutrients by breaking down the cell membranes. More Fruit and Vegetable Nutrition Articles Like this One. Note: Carrots phytonutrients and over 30 different Fruits and Vegetables plus sea vegetables, special colon cleansing fiber, a special blend of probiotics, 17 herbal concentrates, antioxidants and a complete multi-vitamin and mineral supplement. All are contained in the Daily Biobasics Multi-vitamin and Mineral Supplement Nutritional Power House!